TONE has done it again! 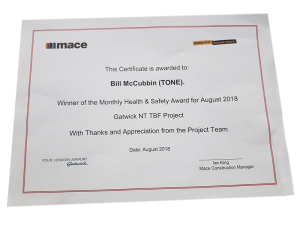 Bill McCubbin accepted the award from Mace for the Health & Safety Award [Gatwick NT TBF Project]. It is the 4th month in a row TONE Scaffolding has been given this Safety Award. Well done to all the team and everyone involved in achieving this award.